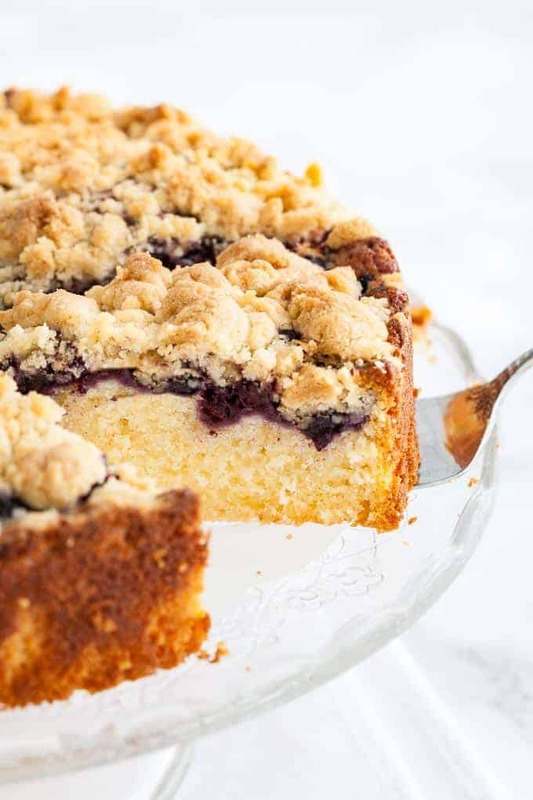 This Blueberry Cake is filled with a layer of juicy blueberries and has a cookie-like crumble topping on top! A moist and buttery coffee cake recipe that is easy to make from scratch and tastes even better on the next day. 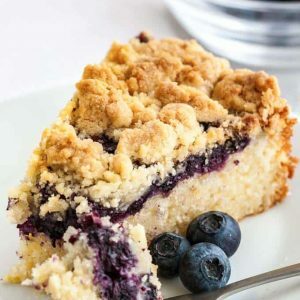 This homemade blueberry cake recipe with a crumble topping is bursting with flavor and has a buttery and moist texture! It’s made with simple ingredients and takes only a few minutes to whip up but the best thing is that it can be made ahead of time. Perfect for busy mornings! This is one of those cakes that taste even better on the next day. 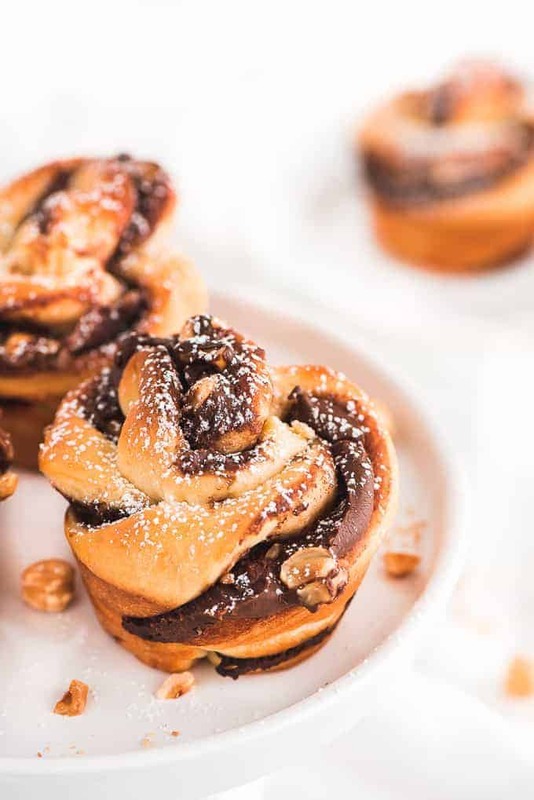 My family is a big fan of sweet breakfasts – cake, pancakes, cinnamon rolls are all a favorite in our house but if I serve something with streusels on top they go extra crazy. An easy crumble topping is by far my favorite thing to put on a cake! 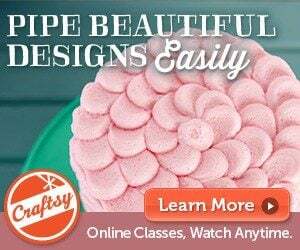 It’s so easy to make and transforms a simple cake into something special. This blueberry coffee cake makes a great breakfast but also would be a perfect dessert for Easter. It’s always a hit when I make it and gone in seconds. 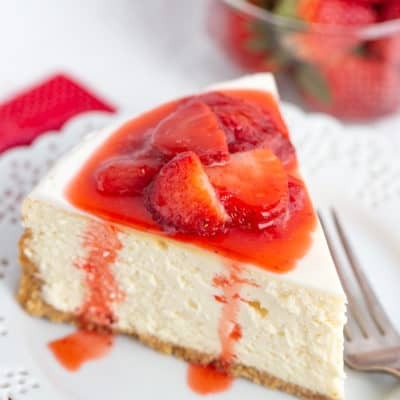 Your guests will be begging you for the recipe! Don’t skimp creaming the sugar and butter together until pale and almost doubled in mass! This step aerates the butter and will result in a finer crumb and lighter texture. Use freshly squeezed lemon juice for the best flavor. 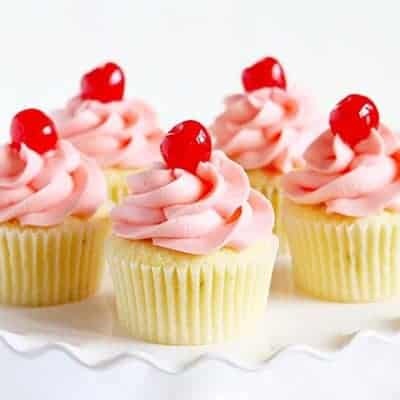 To make your own cake flour at home, take one level cup of all-purpose flour, remove two tablespoons, and then add two tablespoons of cornstarch back in. Sift the flour to distribute the cornstarch well before adding it. The batter will be thick! It should not be runny. 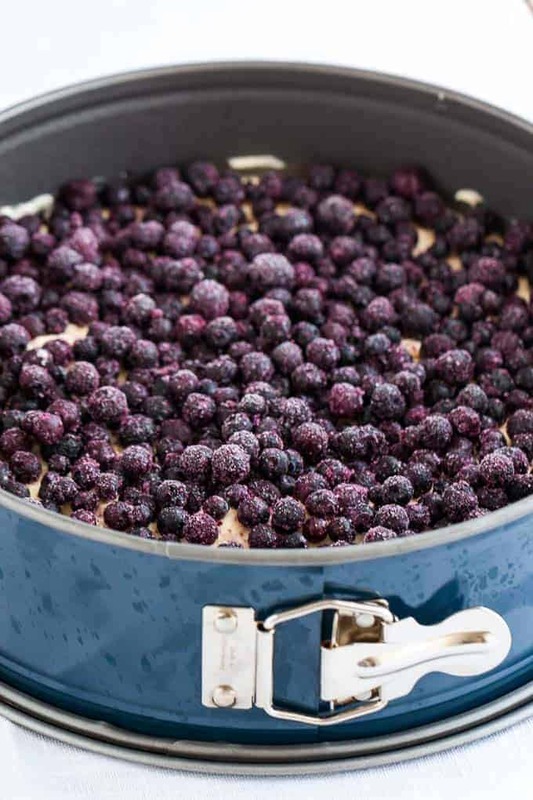 You can use frozen or fresh blueberries for this recipe. I prefer frozen blueberries because I always have some in the freezer. Don’t skip prepping the springform pan! Spray it with non-stick spray and line it with a parchment paper round. 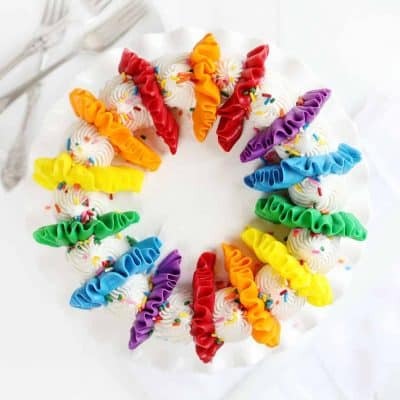 If you don’t have a springform pan you can also use a normal 9-inch cake pan combined with parchment paper rounds that have tabs to help lift the cake out. But a springform pan works best! This cake tastes best on the next day. Store it covered at room temperature. It keeps fresh for 2-3 days. Always test with a skewer if the cake is done! Every oven is different so baking times can vary. A wooden toothpick works best. This cake tastes great with homemade whipped cream. How do you make a crumble topping? There are many different ways to make a crumble topping, some are made with nuts or oats and some use different sugar, butter, flour ratios. I prefer a German-style crumb topping that bakes up into cookie-like crumbs. It’s made with less sugar than a traditional crumb topping that usually bakes up into a sandy-like topping that shakes off easily. To make German streusel combine all the ingredients in a stand mixer and mix until all the flour is incorporated, then use your hands to distribute the streusel evenly. 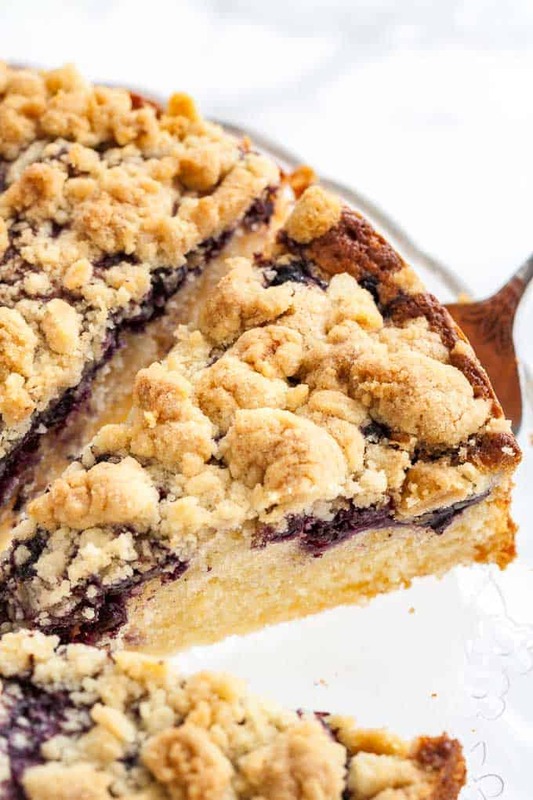 Can this blueberry coffee cake be made ahead of time? 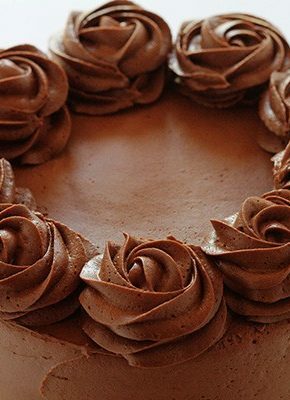 Yes, you can make this cake ahead of time. It tastes delicious fresh out of the oven but even better on the next day in my opinion. Store it covered at room temperature (or in a cold place if it’s a hot day). It will keep fresh for 2-3 days, probably even longer but it’s always gone before I could test it. Can I use other berries to make this coffee cake? 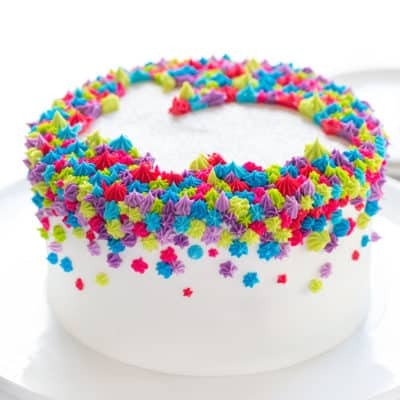 Yes, you can also make this cake with other berries. I have also made this cake with raspberries and it was delicious, too. You can also omit the berries altogether and opt for a traditional coffee cake! If you don’t have sour cream on hand you can also use the same amount of whole-milk yogurt. Whole-milk Greek yogurt is closest in texture and flavor. Don’t use non-fat yogurt because it will change the texture too much. If at all possible, stick to the sour cream coffee cake recipe. Preheat oven to 350˚F. Grease a 9-inch springform pan with butter or non-stick spray and line the bottom with parchment paper. In a small bowl combine flour, baking powder, baking soda, and salt. Set aside. 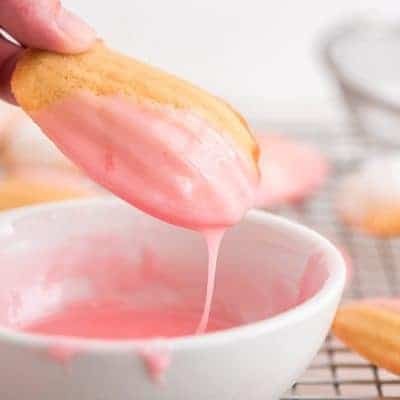 In the bowl of a stand mixer fitted with the paddle attachment cream butter and sugar together until light and fluffy, about 4-5 minutes. Add the eggs, sour cream, and vanilla extract and mix until combined. Then add lemon juice and freshly grated lemon zest. With the mixer running on low speed, add flour mixture to the batter and whisk until just combined. Don’t overmix! Transfer batter into prepared springform pan and spread evenly with a spatula. Top with frozen blueberries and spread evenly. To make the crumble topping, combine flour, sugar, lemon zest, and butter in the bowl of a stand mixer. Mix for about 2 minutes until all the flour is incorporated. Distribute the streusel evenly over the blueberries with your hands. Bake for about 60-70 minutes, or until a toothpick inserted in the center of the cake comes out clean. Let the cake cool in the pan on a cooling rack for about 15 minutes then remove the outer ring of the springform and let cool completely. If you like this easy cake recipe you need to check out my other recipes at platedcravings.com where I share easy comfort food such as desserts, cakes, appetizers, dinners, German food and more. I’m happy to be a contributor on i am baker and add recipes to Amanda’s already great collection. If you are a dessert lover just like me, I hope you try this German Apple Streusel Sheet Cake Recipe as well! Oh man, this looks soo good! It wouldn’t even last a day in my house. Que delicioso…. Pronto lo prepararé!!! What kind of chocolate cookie crumbs? I am thinking of using Oreo but not sure if the flavor would clash. I absolutely LOVE your site btw! Have yet to find a recipe I do not like. Thank you! Well, this was fascinating! 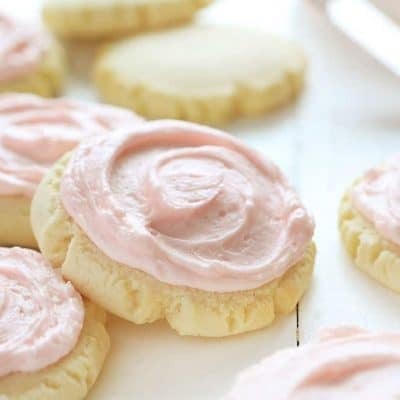 I have made a lot of scones in my day, but had never heard of using cake mix along with flour in order to make them. Now, I have to try this. I believe I only have yellow cake mix, but I’m guessing that would work, right? Also, while digging through my freezer, I found a big bag of frozen blueberries. I have been craving lemon blueberry scones, so I will be careful to make sure my blueberries are completely thawed and dried. Great tips! The recipe calls for cake flour which is a finely ground flour, not a cake mix. Yum! I made this for breakfast, and it was so delicious! 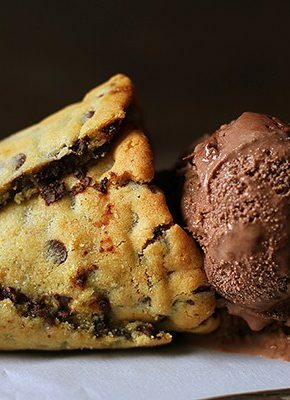 This looks so delicious. 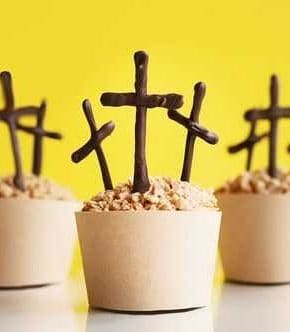 I am going to try and make this. Thanks for sharing your recipes. Hi, I’m going to try to make the BBCoffee cake, but it calls for 2c of cake flour. You gave rec for cake flour,but you only used 1c. 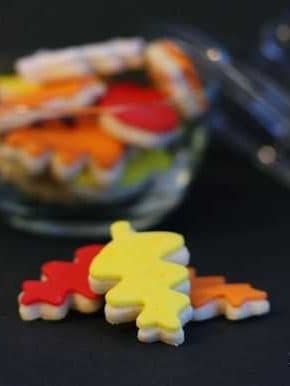 Am I to make two batches of cake flour for this recipe? Can I use fresh blackberries! Not frozen. 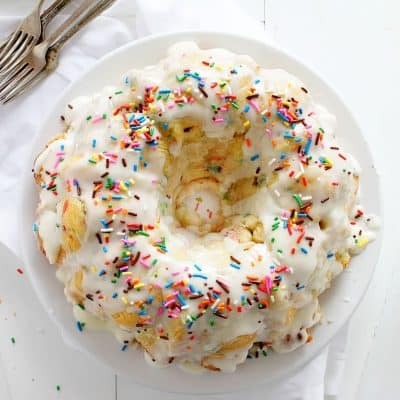 Do I have to use a spring form pan for this recipe? Can i use blueberry in can?we dont have fresh or frozen berries here in the philippines. Well, this looked so good! But I have been baking it for 75 minutes already and its still soupy in the middle!! It is a huge cake and I am going to be really disappointed if it doesn’t come out. Just put the timer on for another 10 minutes. Fingers crossed. Okay, so I baked this cake for 85 minutes! Took it out of the oven and placed on a rack, went to the gym, came back 2 hours later and that sucker is still just a little warm. 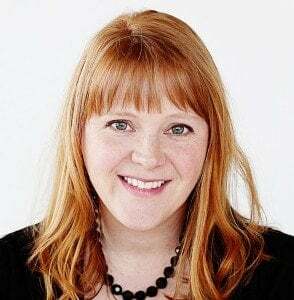 Well, I had to cut just a tiny sliver – OMG! That thing is awesome!If it is better the second day, I can’t wait for tomorrow!! Thanks Amanda! Would this work doubled in a 9×13? This is not coffee cake. It’s lemon cake! Awesome cake, reply lovely thanks Amanda.im hooked on your recipes. 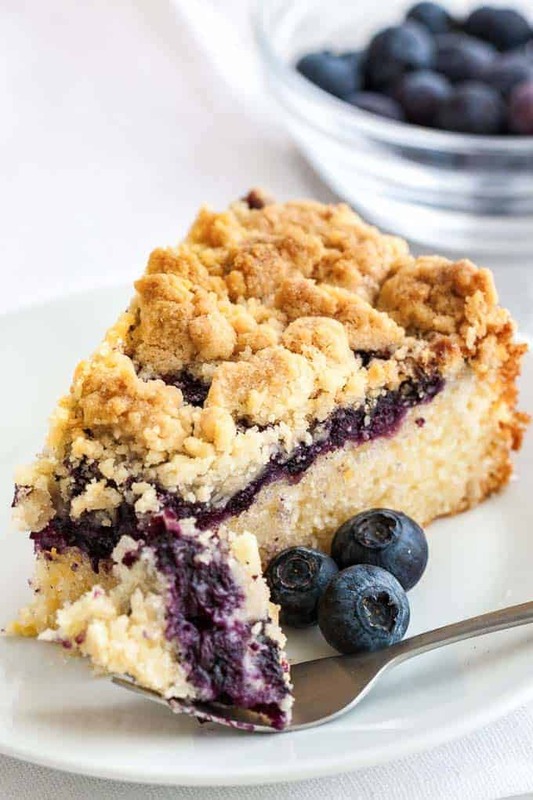 This recipe is the best blueberry “coffee cake” that I’ve tried. 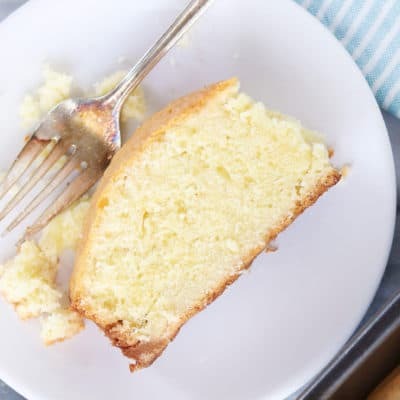 I love the hint of lemon in it, and the cake flour lends a tender, melt-in-your-mouth texture. 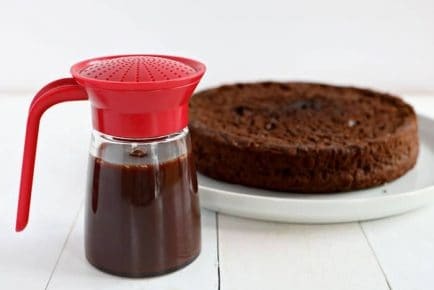 You have to make this!